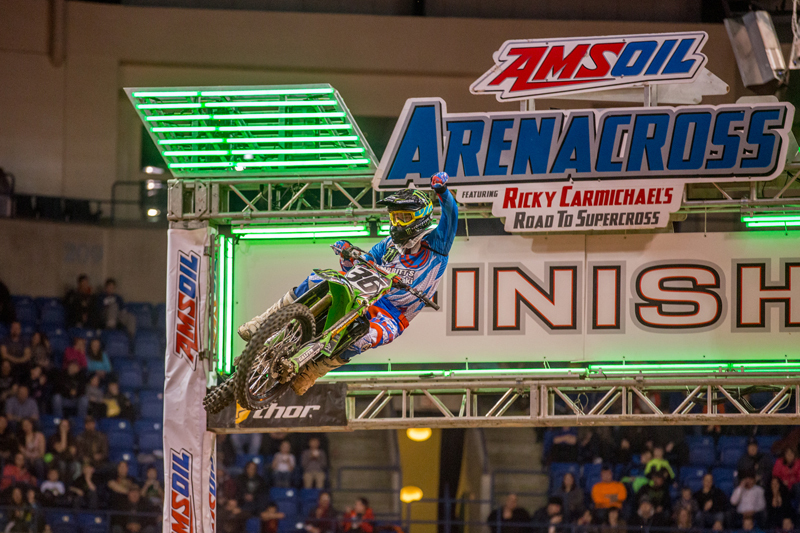 WILKES-BARRE, Pa. (February 7, 2015) - The fifth round of the 2015 season of AMSOIL Arenacross, featuring Ricky Carmichael''s Road to Supercross, came to a dramatic conclusion on Saturday inside Mohegan Sun Arena at Casey Plaza. As has been the trend thus far in the championship, another new named emerged with the overall victory in the Arenacross Class as Team Babbitt''s Monster Energy/AMSOIL Kawasaki''s Matt Goerke earned the first win of his AMSOIL Arenacross career, becoming the sixth different winner in eight races. 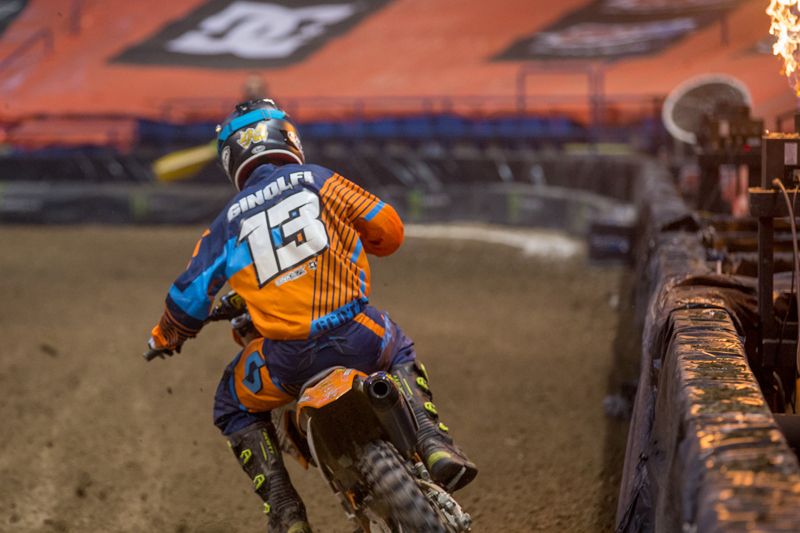 In the Eastern Regional Arenacross Lites Class, points leader Dave Ginolfi took the win aboard his Spinechillers Racing KTM to extend his advantage in the championship. Goerke broke through for the first overall win of his AMSOIL Arenacross career. In his first full season of AMSOIL Arenacross competition, Goerke has been one of the most formidable contenders in the Arenacross Class and in the first Main Event of the evening he put himself in position to earn the overall victory. Husqvarna TiLUBE TUF Racing''s Kyle Regal began the Main Event in the lead, just ahead of Goerke and Motosport.com/Haeseker Racing KTM''s Gared Steinke. Regal and Goerke established themselves out front while Team Babbitt''s Monster Energy/AMSOIL Kawasaki''s Chris Blose moved past Steinke on Lap 3 to take over third. Shortly thereafter, fellow Team Babbitt''s rider Jacob Hayes slotted into fourth, setting his sights on his teammate. Regal maintained his advantage over Goerke for half of the Main Event, but the gap between the two slowly narrowed in the closing laps. As the battle up front intensified, Hayes was able to make his way around Blose just after the finish line on Lap 10. Out front, Goerke was looking for a way around Regal and after several attempts, made the pass stick after the whoops on Lap 13. Regal attempted a counter move, resulting in contact between the two riders that briefly paused their momentum. Hayes closed in quickly as a result and ultimately made contact with Goerke, causing Hayes to fall to the ground. Both Goerke and Regal resumed out front, with Goerke in the lead, while Hayes ended up losing several positions. Goerke took the win with Regal second and Blose third. It was Goerke''s first Main Event win of the season. Thanks to his triumph, Goerke had the opportunity to select the inversion of the second Main Event, picking the number eight. As a result, half of the field was inverted heading into the final race of the evening. Goerke and teammate Chris Blose (near) celebrate their 1-2 finish. Regal seized the opportunity again out of the gate in the second Main Event and took early control of the lead ahead of teammate Gavin Faith and Hayes. Blose wasn''t far behind in fourth, while Goerke settled into fifth. In an effort to run down his teammate for the lead, Faith made a mistake in the rhythm section on Lap 2, allowing both Hayes and Blose to pass. In the ensuing laps, Hayes closed in on Regal for the lead and made an aggressive pass coming out of the whoops on Lap 6 that caused heavy contact between the two riders and forced Regal off the track. Once out front, Hayes was able to slowly and consistently build a gap over Blose, with Faith in third and Goerke in fourth. The top four remained the same until Lap 11, when Faith made a move on Blose to reclaim the runner-up spot. Hayes cruised to the win with Faith and Blose completing the top three. Goerke finished fourth and his consistency on the evening (1-4), combined with a win in the RMATV/MC Head 2 Head Challenge, gave him the overall win ahead of Blose (3-3). Faith''s late pass for second helped him secure third overall (5-2). Regal rebounded from his incident with Hayes to finish sixth in the final Main Event and claim fourth overall (2-6), with Hayes rounding out the top five (8-1). Goerke took a chunk out of his deficit to Hayes in the Arenacross Class championship standings, and now sits 14 points out of the lead. Regal maintained his hold on third, 22 points back. Blose and Slaka Wear KTM''s Steven Mages round out the top five. Ginolfi now holds a comfortable lead in the Eastern Regional Arenacross Lites Class Championship. On Friday night Ginolfi finished second in the Eastern Regional Arenacross Lites Class Main Event, but on Saturday he enjoyed a near-perfect performance by going wire-to-wire. The KTM rider started the 15-lap Main Event with the holeshot ahead of Watson Metals/Compound MX Honda''s Kyle Bitterman and Hillview Motorsports Suzuki''s Steve Roman. The top three went unchanged throughout the entirety of the Main Event, but Ginolfi and Bitterman were never separated by more than a second. The Honda rider put on the pressure in the final laps, but Ginolfi held him off to claim his second Main Event win of the season. Ginolfi added to his Eastern Regional Arenacross Lites Class points lead and now sits 23 points ahead of Roman. A&Y Racing Honda''s Daniel Herrlein sits third. The action in Wilkes-Barre was intense. AMSOIL Arenacross will take its first break in action of the 2015 season next weekend before returning for the sixth round of the championship on Saturday, February 21, from Tampa, Florida, and Amalie Arena. Action begins at 4 p.m. PT / 7 p.m. ET. Tickets for each round of AMSOIL Arenacross are on sale now! 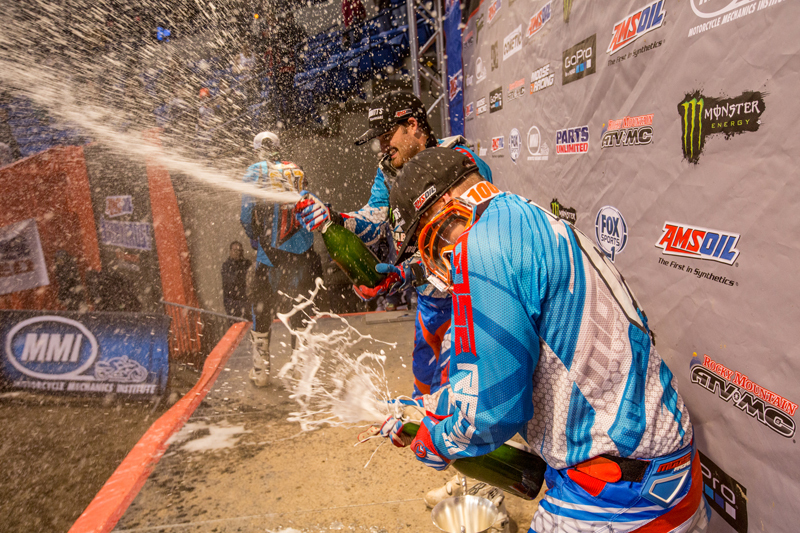 The entire AMSOIL Arenacross season will air on FOX Sports 1, including re-airs on Fox Sports 2. 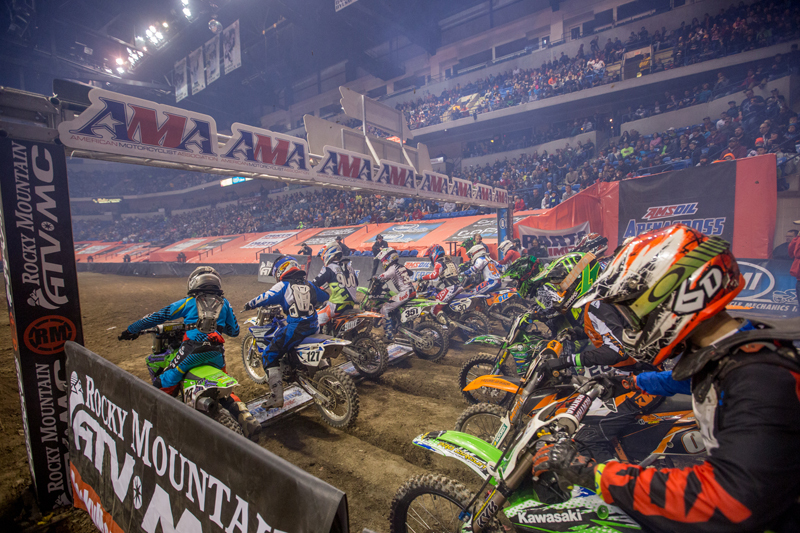 Live timing and scoring from each round of the AMSOIL Arenacross season returns for the 2014 season! To follow the intense racing action live, log onto www.Arenacross.com.